If you’re a Conservative/LibDem supporter, this must be like watching Titanic, except that Nick Clegg and David Cameron and Ed Miliband aren’t even as appealling as DiCaprio, Winslet, and Zane. The iceberg has hit, the ship is peeling apart and sinking, and yet you know the end of the movie is ages away and already seems to have been going on for far too long. For the rest of us, though, things as much worse than simply enduring a long, long movie in the cinema as being on the Titanic was worse than taking part in the movie. Paul Goodman, executive editor of ConservativeHome, offers four reasons why he does not believe the Tories can win a majority in 2015. Austerity: The proclaimed conviction that if only enough people are unemployed or in work but struggling on a low income, plus essential services cut to the bone and cut again, then the economy will improve. The belief that the economy must be destroyed in order to save it is essential to Tory thinking and was adopted by the LibDems with hardly a gulp. Labour can only lose if they adopt it too. Michael Green is an MP. Tonbon is a village. Tim Montgomerie does not write in defence of Michael Green’s spam spivvery: he ignores it, claiming that he is “not in a position to respond”. Well, no doubt: ConHome is owned by Lord Ashcroft, and whatever Tim’s private feelings about this kind of Internet marketing as the manager of a blog who works hard to see it filled with interesting and original content, he really isn’t in a position to respond to the Tory Chairman’s use of “scraping and spinning” to generate content for profit. Instead, Tim Montgomerie focusses exclusively on the anonymous self-editing of Wikipedia, where Shapps defenders are on slightly less shaky ground. I’m not in a position to respond to every allegation that’s been made against the new Conservative Chairman but at the root of the controversy has been a long-standing attempt by (1) his political opponents to use Wikipedia to smear him and then (2) those same opponents then attack his attempts to counter those smears. David Cameron has appointed Grant Shapps co-chairman of the Conservative Party in the latest Cabinet reshuffle. The Tories have an image problem, you could say. George Osborne was booed tonight by 80,000 people at the Paralympic Games. The Conservatives are widely perceived as the party of arrogant posh boys who don’t know the price of a hot pasty or a pint of milk, headed by men who went to Eton and were members of the Bullingdon Club at Oxford, the government for millionaires by millionaires, the party of tax cuts for the rich and high unemployment, workfare, and lowered wages for everyone else, the coalition of broken promises and NHS privatisation. Indeed, they have an image problem. The Chairman of the Conservative party is a Cabinet Minister when the Tories are in government, and runs the “party machine”: oversees Conservative Campaign Headquarters. has learned from senior government sources that Sayeeda Warsi has lost her job as Tory co-chairman and is replaced by Grant Shapps. We have also been told that Sayeeda Warsi has been offered another seat at the Cabinet table. The role on offer at the time of writing is rumoured to be as a junior Foreign Office minister with a seat at the Cabinet table, a position she has not yet accepted. But if the Tory party were to believe they need to listen to a woman, who is moreover not white and who comes from a working class, immigrant background, how they have to change to appeal to voters – this would turn the whole ethos of the Tory party upside down. No, what David Cameron and George Osborne are apt to think they need isn’t some kind of radical policy change: they need a campaign to change their image. They need a marketing man. 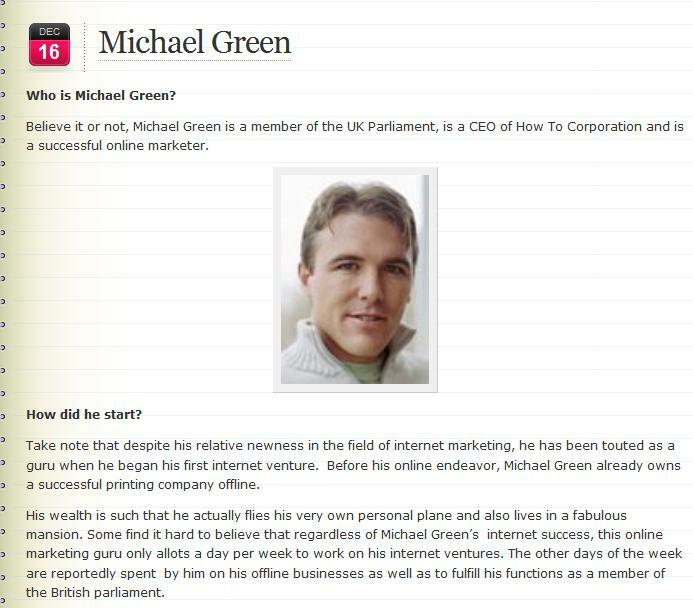 Grant Shapps has an alternate career: he’s “Michael Green“.